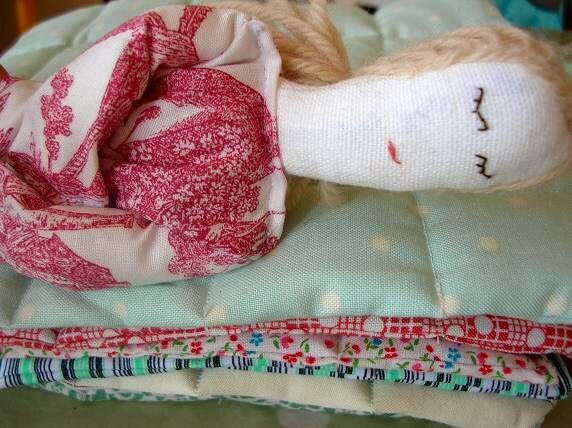 I had a commision recently for a blonde Princess and the Pea set and really enjoyed making it. I love the idea of the Princesses having different hair colour and dresses and of course it makes it a lot more fun for me too! 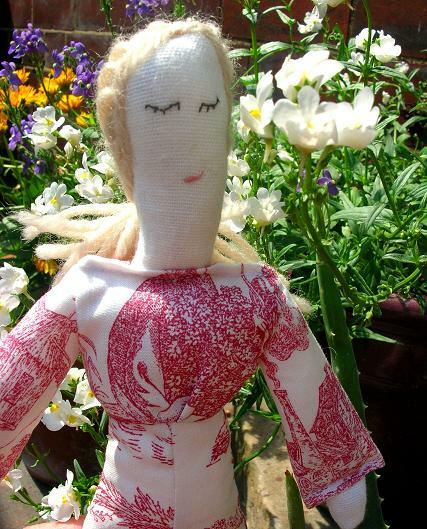 She's wearing a Laura Ashley red Toile print dress and has beautiful blonde yarn hair. Just look how much she's enjoying the sunshine in her flower garden. As you can see, she's a very peaceful Princess. I've used a couple of new fabrics for the mattresses (as well as the standard ones). And I'm glad to say that I've got these down pat now. For a while I was finding it very time consuming quilting ten tiny mattresses, but I have developed a technique that lets me whiz through them (relatively speaking). I'm probably going to start making the totes in different fabrics as well. 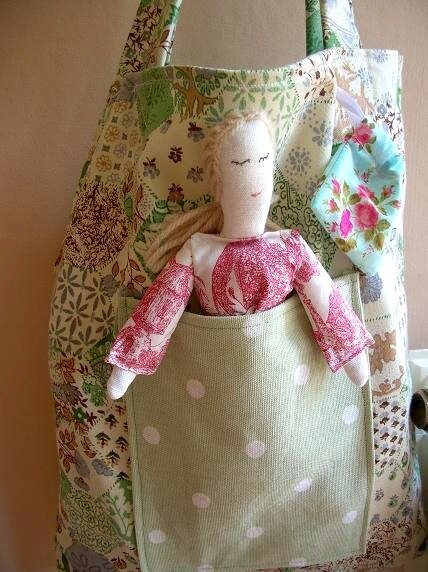 Although I love this green vintage fabric and it is perfect for them. It's a really good weight and is nice and strong, so it will survive being dragged around! On another note, I was leaving some of my bits lying around today on my kitchen table (so to speak! ), so that a particular visitor I had, could see them, without it looking like I was shoving them in her face and it all looked so pretty that I just had to take a photo. And yup, there she is, one side of the latest topsy turvy doll. I love her. And I'm loving her other half too. 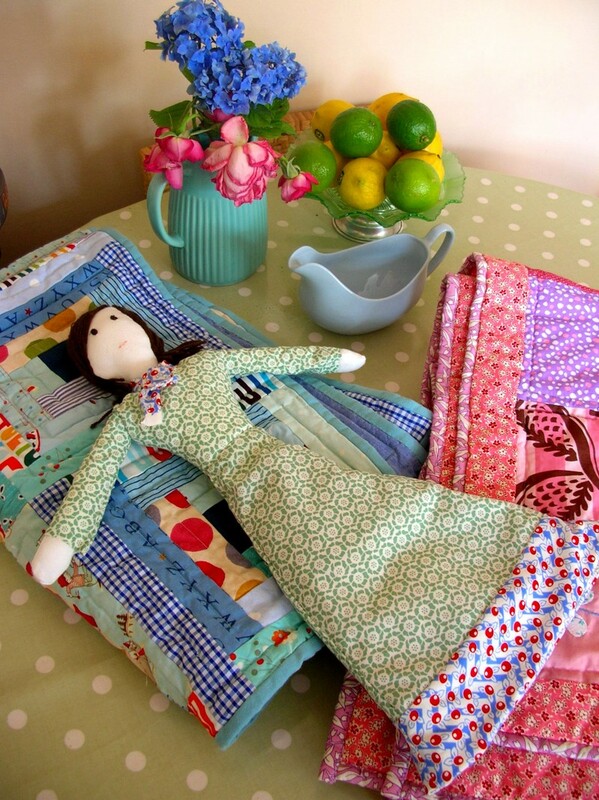 In fact I'm enjoying it so much that I've decided to make some 'normal' dolls too - (so the answer to your question Molly is 'yes' I am making some normal dolls - sorry for being the slowest responder in the world!). 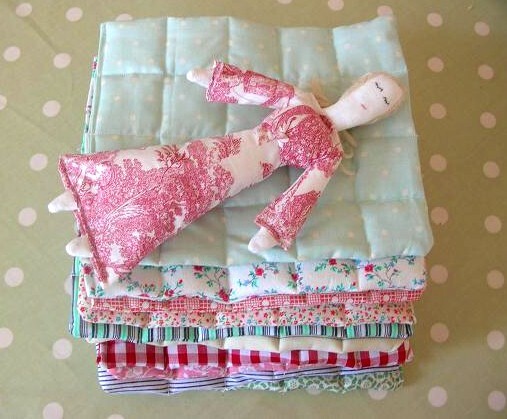 The Princess and the Pea set is now in the shop now.